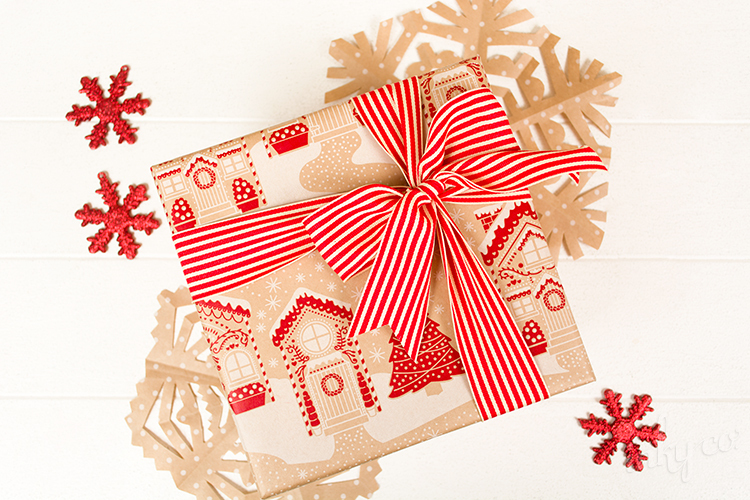 Introducing our final Christmas wrapping paper release for 2014 - The Kraft Christmas Collection! 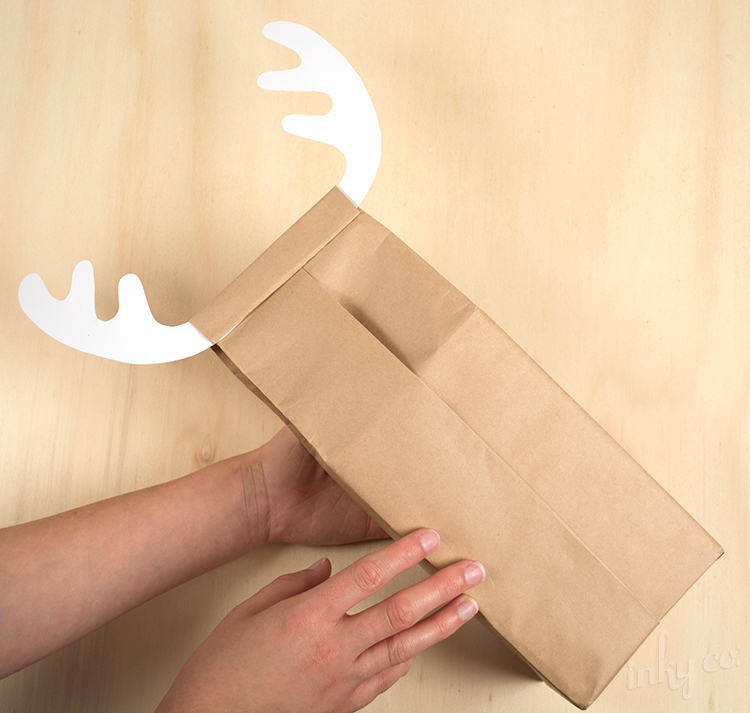 Or get jolly with our jumping reindeer in Christmas Dash. 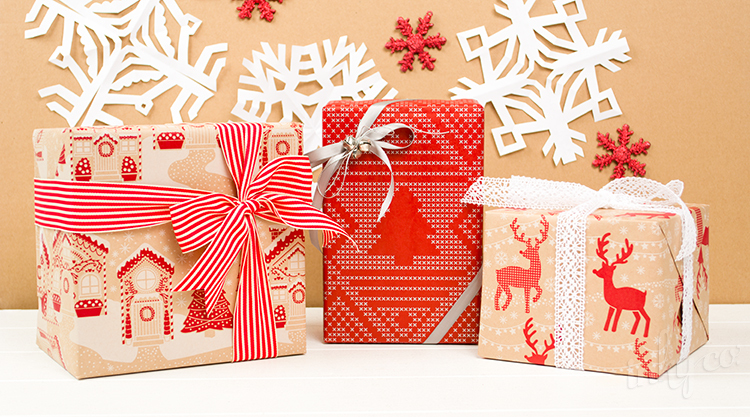 The perfect trio of traditionally themed Christmas wraps, this collection is great all the Christmas nostalgics out there. 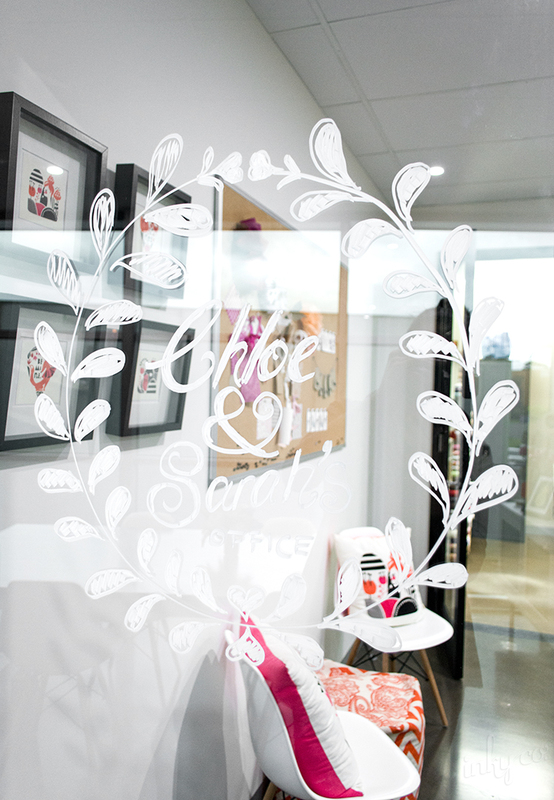 Our office has been jazzed up! 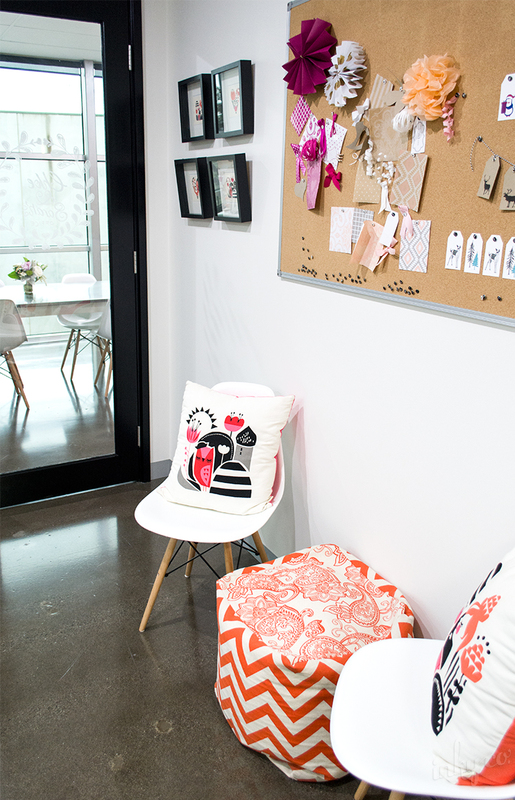 Over the year we have been transforming the Inky Co. space into a lovely office and meeting area. 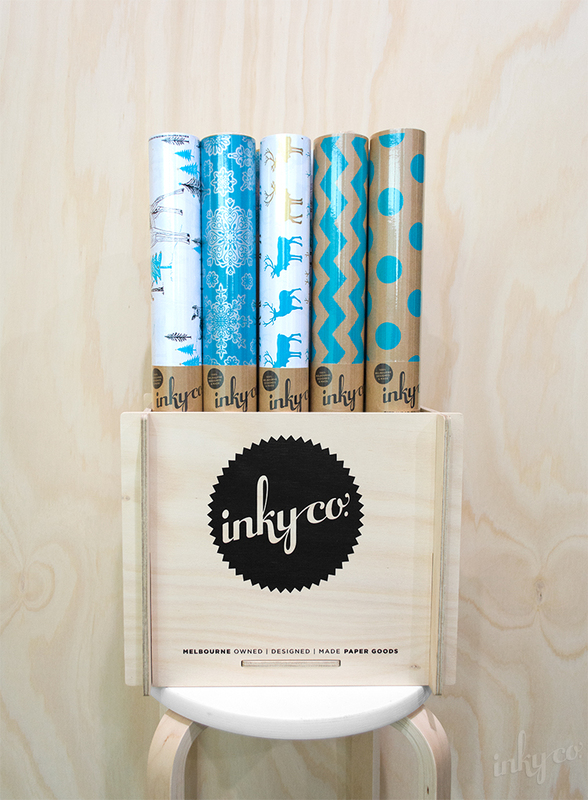 Here is your look behind the scenes of the Inky Co. design hub. Over time we have realised our love for novelty animals, so Barry (our resident Flamingo) got a girlfriend! We named her Barrietta (obviously) and they are our office Romeo and Juliette. 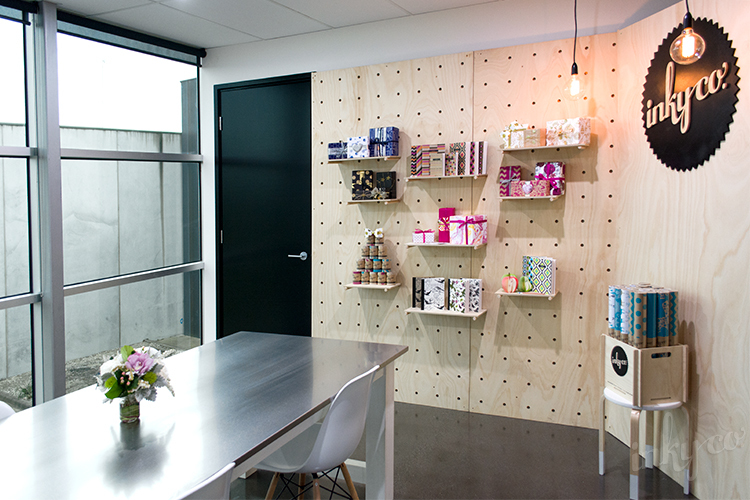 We also (with much help from Harry and Rob) installed our peg wall display, that we used this year at Life Instyle, in our meeting room. 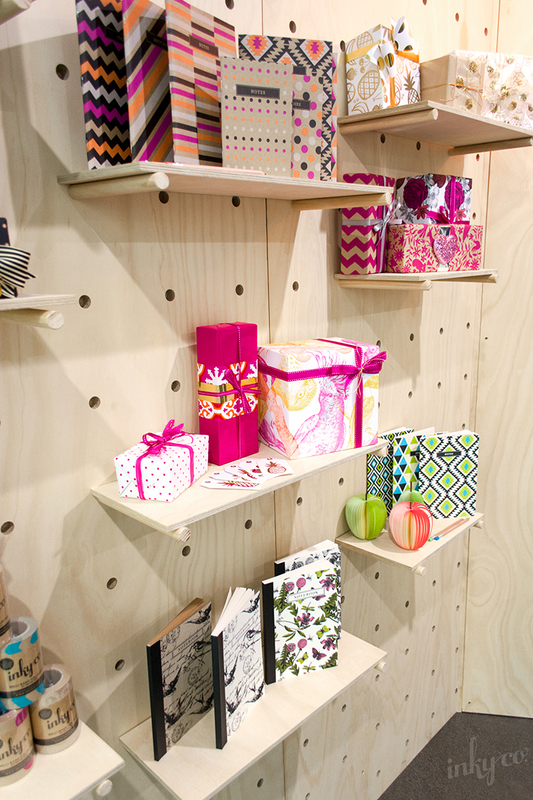 It really completes the space and means we have heaps of room to create displays. 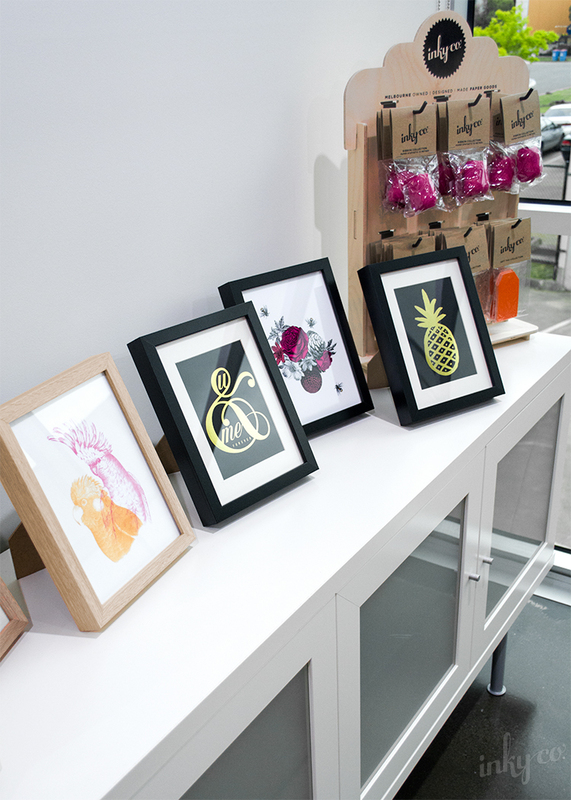 Our collection of prints from Finders Keepers are also showcased. These will be available soon on our website! Stay tuned. The office has really turned into a lovely place to work. Bring on more interior decorating! (And trips to Ikea - the land of happiness). 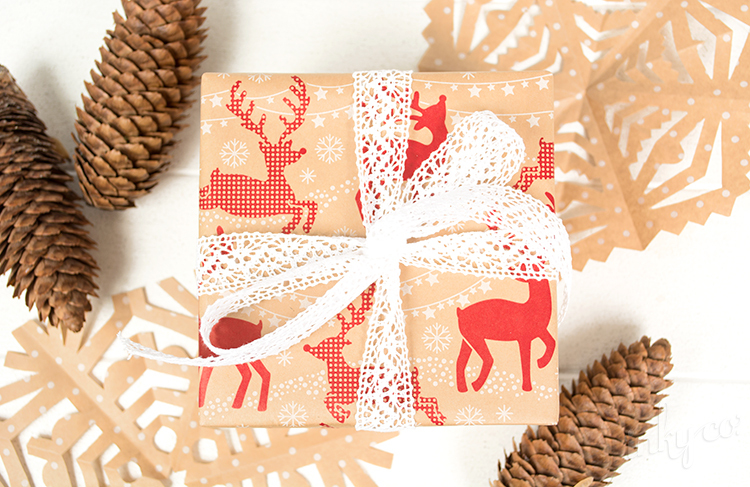 Introducing the new Red & Gold Christmas collection, featuring three bold designs printed on our 100% recycled Eco stock. 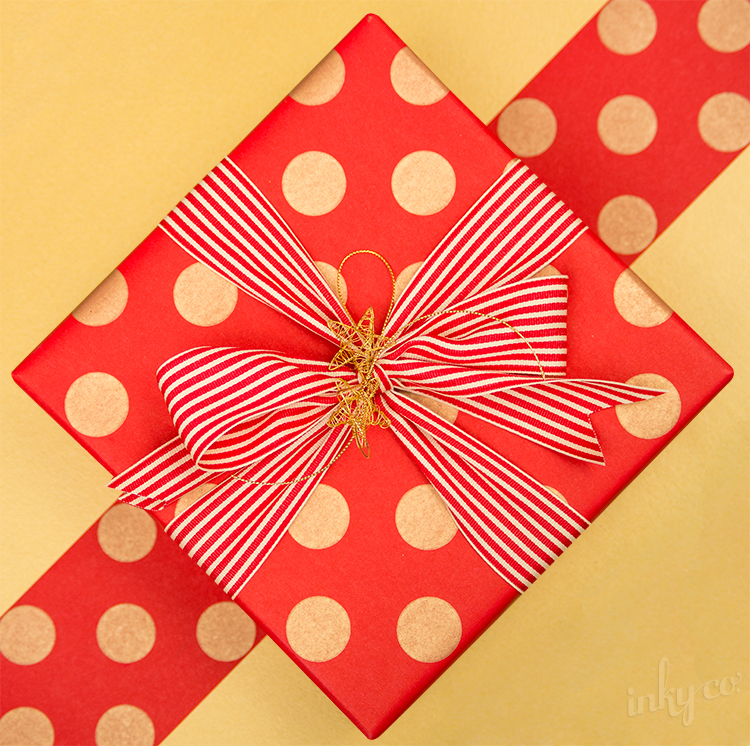 A twist on our much loved classic designs, the new range features Eco Large Gold Dot Matte Red, Eco Gold Stripe Matte Red and Eco Micro Gold Dot Matte Red which mix perfectly with the our solid Enviro Red roll wrap. 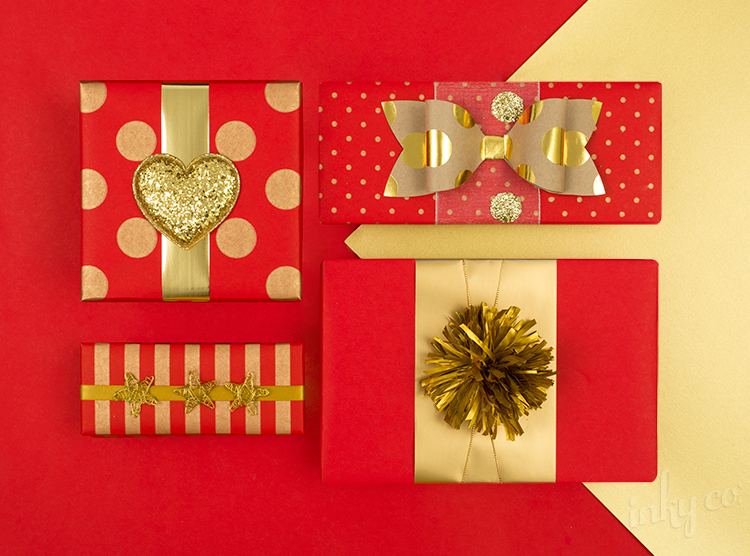 Add some chunky ribbons (Grosgrain Stripe Red Cream, Organza Glitter Dot Red, Gold Foil Poly shown above) and some petite metallic accessories like our Gold Bells or Gold Wire Stars to create a simple yet dramatic effect. 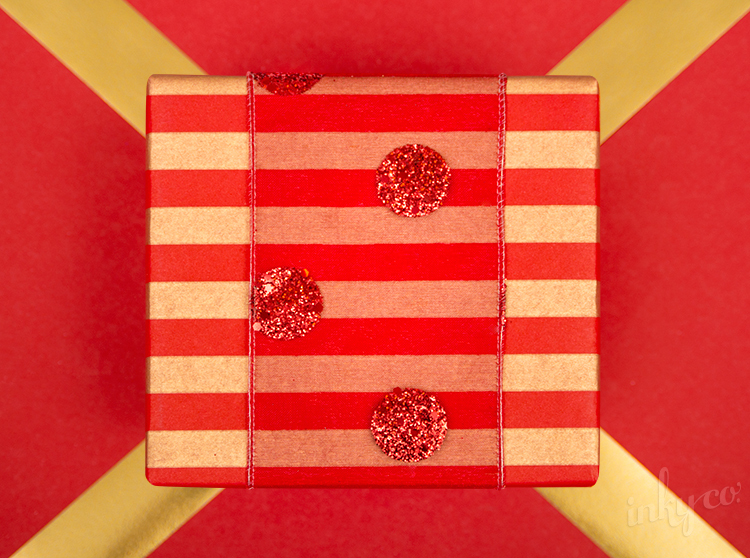 For this DIY we will show you how to take your gift wrapping to a whole new level! 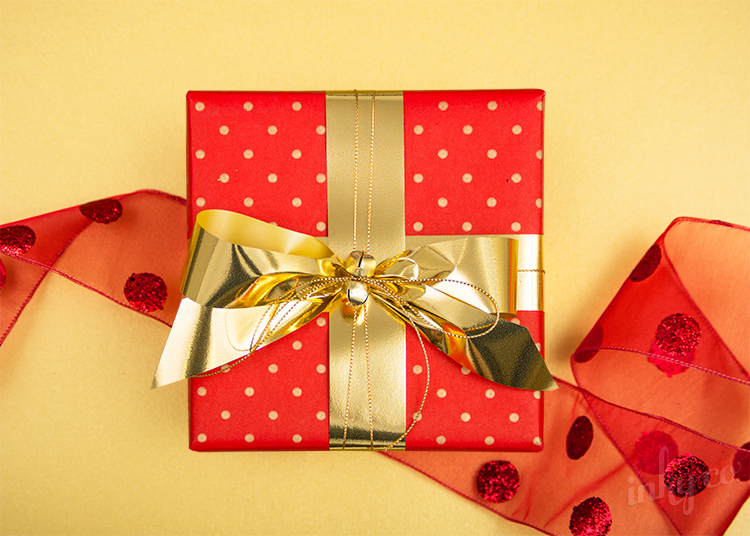 Use this technique to create special characters out of your gifts to give to friends and family, or use an empty box as a simple but effective Christmas decoration. 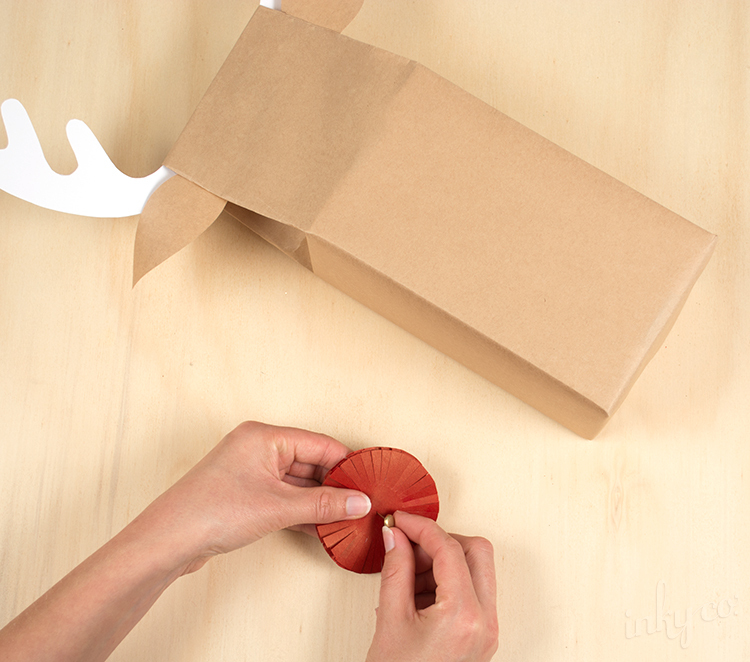 1 x Red Kraft Belli-Band (This is used for the pom-pom nose of the reindeer. Alternatively you can use a Plain Red Seal for this). 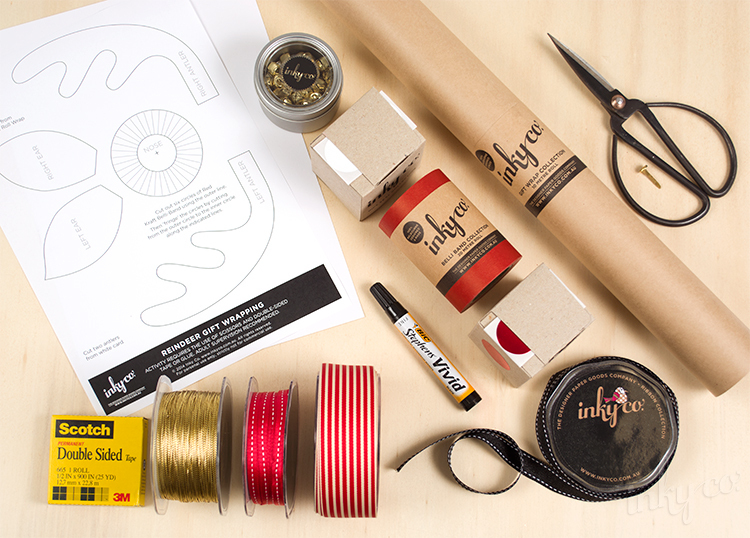 Various Ribbons to decorate your reindeer (We used Stitched Grosgrain 15mm Black, Grosgrain Stripe Red Cream and Metallic Gold Cord). Step 1. 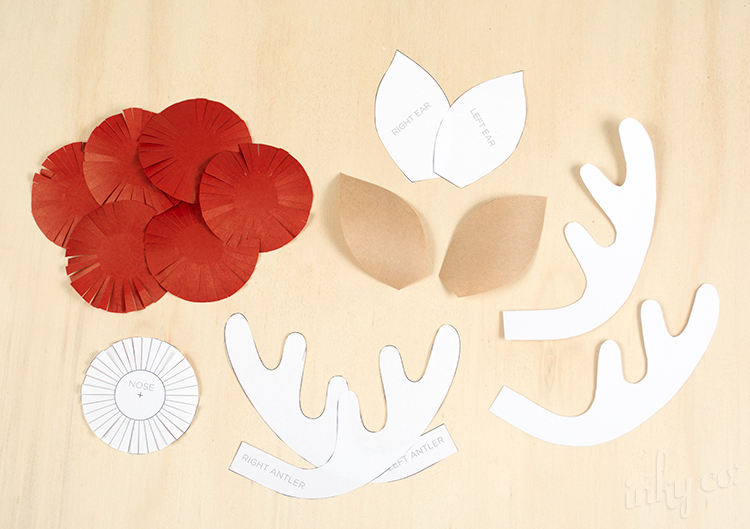 Cut out all the template pieces then use these to trace around and cut out the ears, nose and antler pieces. Step 2. 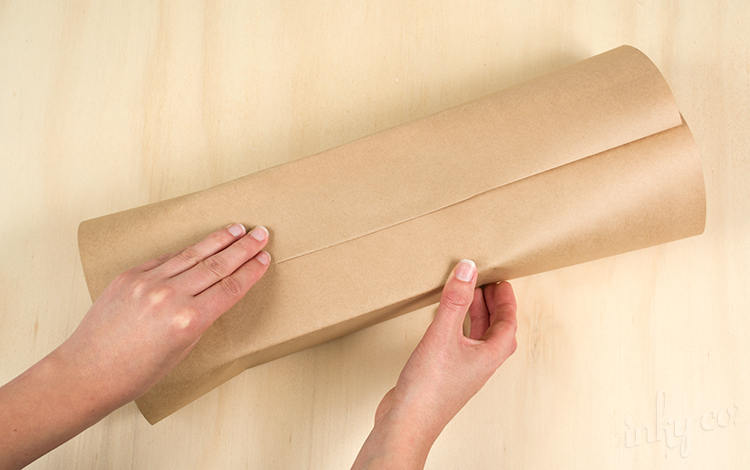 Wrap your gift in Brown Kraft wrapping paper leaving the end sections open. 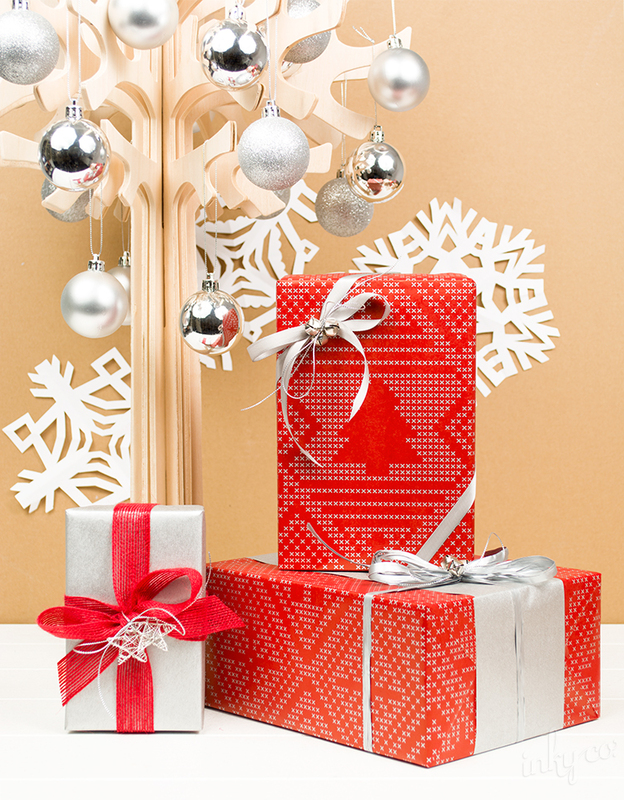 Ensure that the present is positioned close to the bottom of the paper (allowing enough to fold in and close the bottom of your gift), leaving approximately 150mm of extra paper at the top. Step 3. 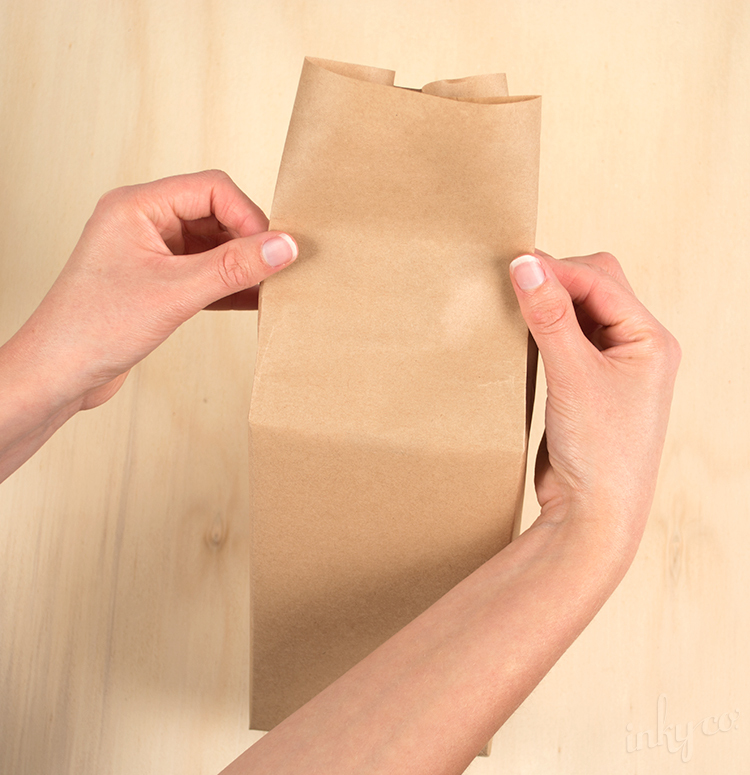 Fold and seal the bottom section only. Step 4. 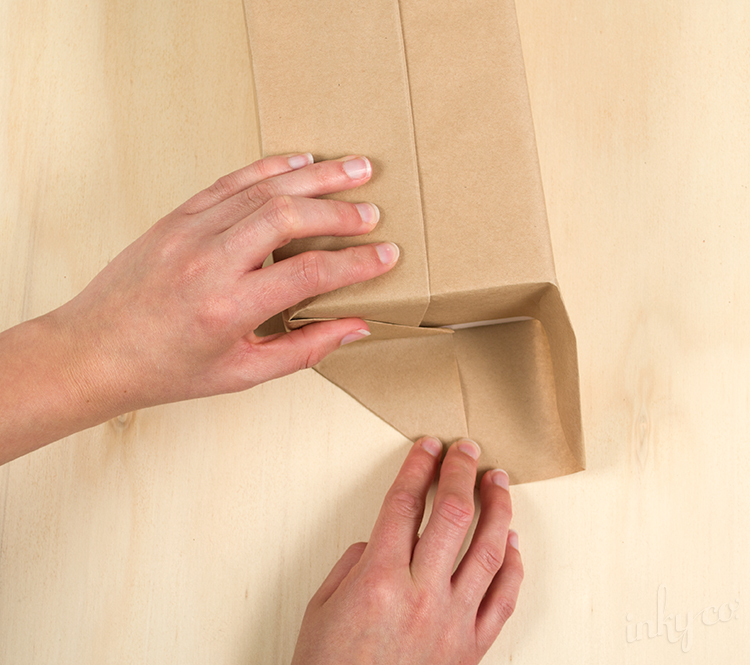 Stand the present up on its end and crease the edges of the paper from the top of the box out to the end of the paper on each of the four corners. Step 5. 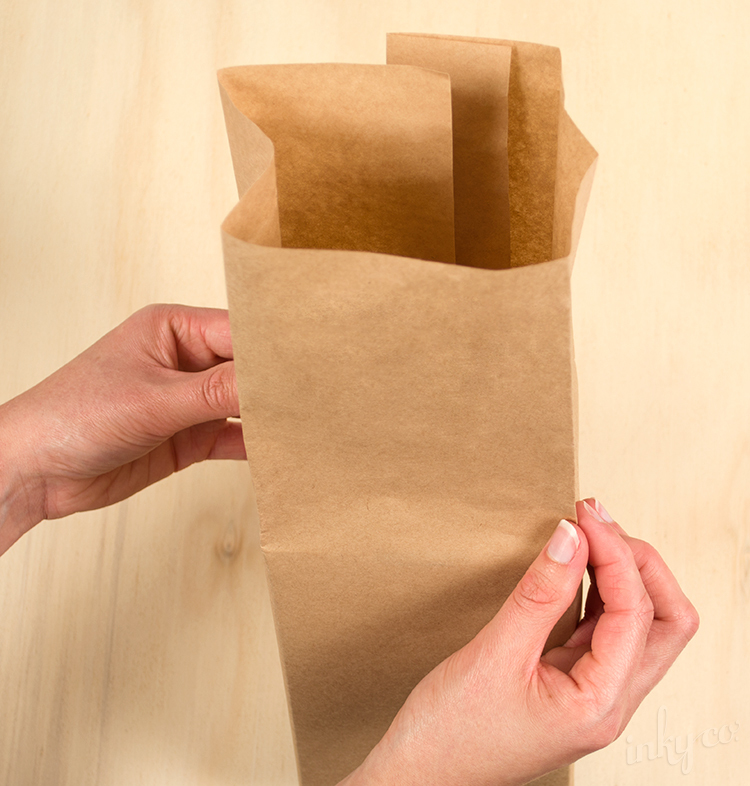 Then pinch together the two sides until the top resembles the folds of a milk carton. Step 6. Fold over a 25mm section down towards the back of the present (the side where the paper joins down the back). Repeat this step several times until you have your desired height. Step 7. 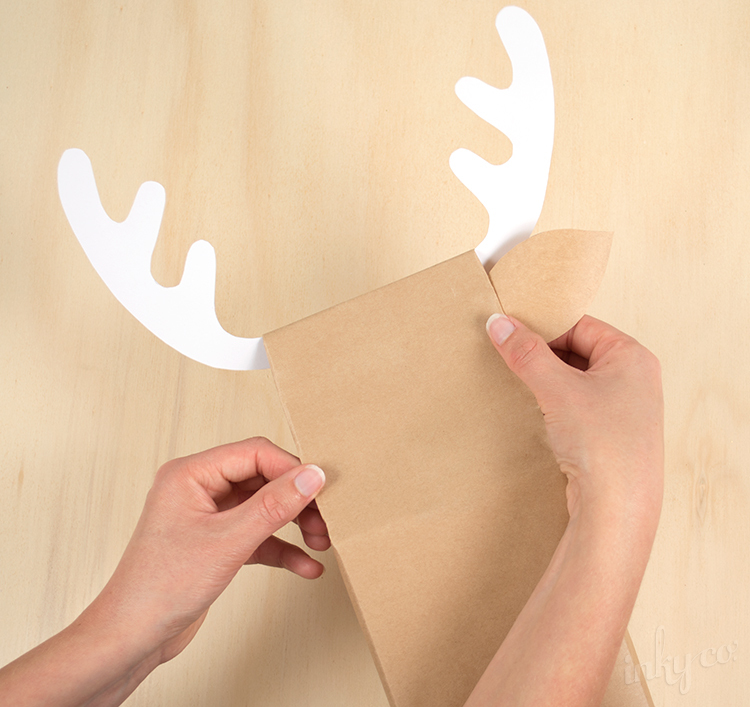 Using your cut out reindeer antlers, slide them under the folded section at the top and secure down with double sided tape. Step 8. 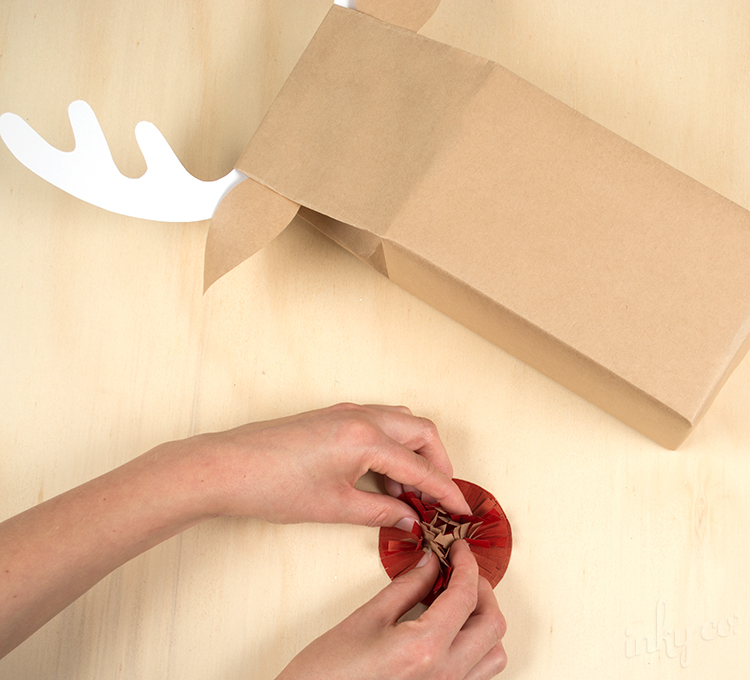 Secure your cut out reindeer ears to the sides of your reindeer head using double sided tape. Step 9. Layer your six fringed nose circles on top of each other and using a split pin, secure together in the centre. Step 10. You can now scrunch the circles at the centre base, pulling upwards, to create your pom-pom nose. Step 11. 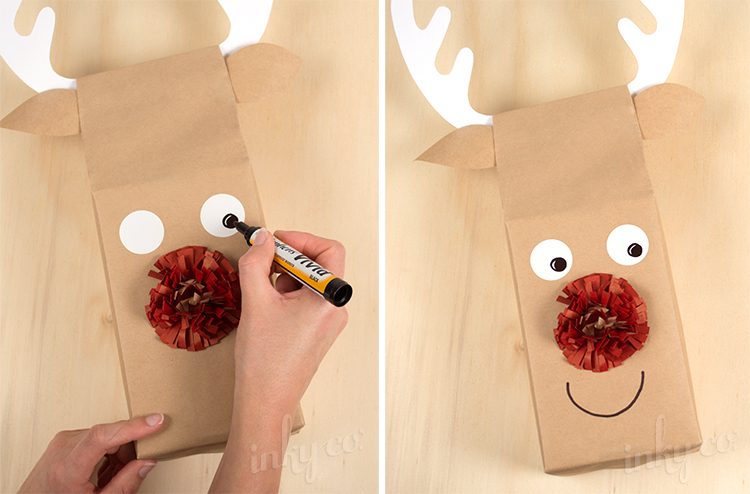 Secure your nose to your reindeer. Step 12. 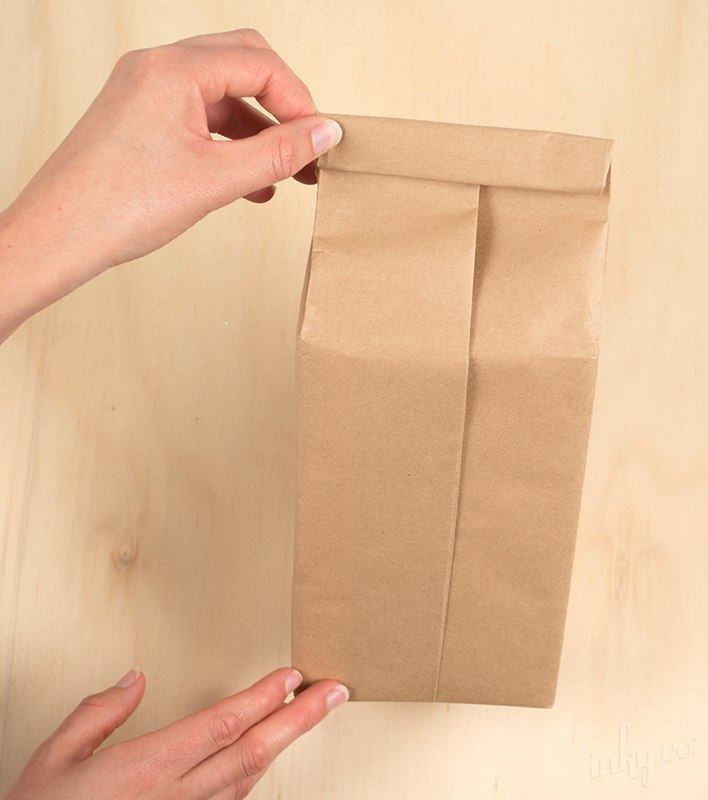 Attach two Plain White Seals for the eyes, and draw on the pupils with your permanent marker. You can also draw on the mouth at this time. Step 13. 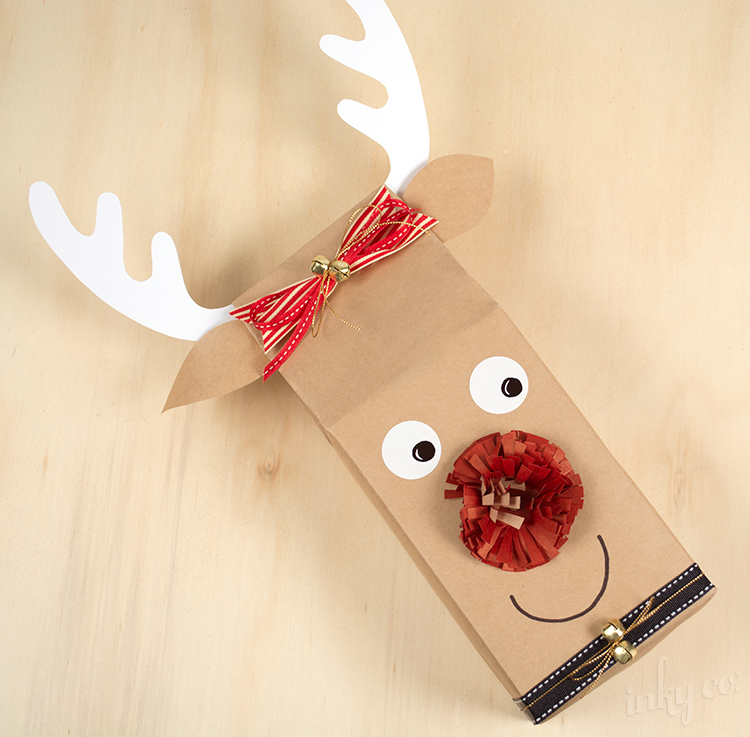 Decorate your reindeer with ribbons and bells to complete your gift. 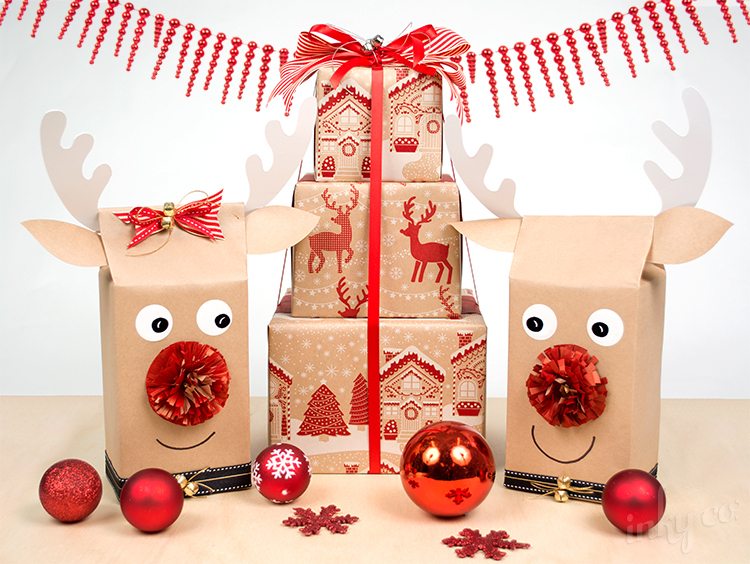 Place your reindeer under the tree or out on display as a special surprise for the lucky gift recipient!